The Walking Dead spinoff that so many fans have been talking about and discussing could actually be a prequel, yeah a Walking Dead prequel. That would not only be really cool, but incredibly awesome. 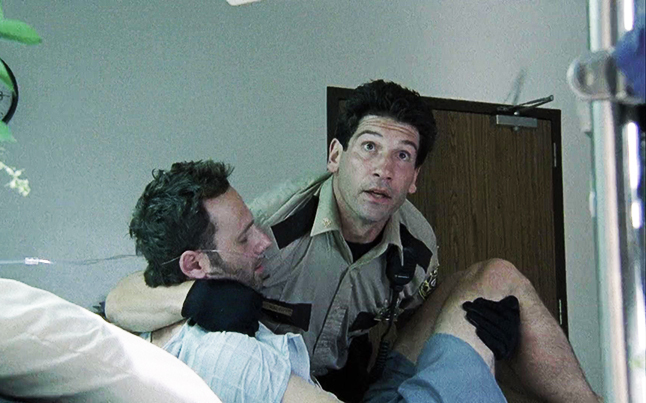 I mean how many of us are dying to know what happened prior to Rick Grimes waking up in the coma? If I had to guess, I would say most of us are. When season 1 of The Walking Dead starts you really don’t get too much background information, then all of a sudden, Rick wakes up in the zombie apocalypse. Wouldn’t it be nice to actually know even just a little bit more? While AMC has not confirmed, and even declined to comment on the idea of the spinoff being a prequel, it definitely has created a lot of talk. We do know that the spinoff will not take place in Georgia, and it won’t even have the same characters. “It’s a really different location with completely different people, so we are going to see an entirely different corner of the ‘Walking Dead’ world,” Kirkman explains. “It definitely won’t be set in Georgia, I can at least say that. The spinoff is set to air sometime in 2015, and so there is plenty of time. However, they should really consider a Walking Dead prequel as that would be the way to go in my opinion. I think everyone simply wants to know more about what happened prior to the world going to hell. That’s stupid. Carl has grown a lot to this day, he couldn’t play a younger Carl. Same thing for Sophia. OMG! Did you read the article? It’s not going to take place in georgia and it’s going to featiure all new characters. Also it’s just a rumour. The prequel will most likely be about the outbreak that we never saw happen on screen. I think seeing the initial outbreak would be kind of cool. They could show governments declaring martial law,social chaos and disorder, and so much more. This is the stuff that made World War Z so fun to me. I’m not interested in a game, though. No problem, I’m not much for ratings personally it was just nice to see an actual background for the two characters. I know right!! We need to start a petition to get his story! I think it would be a good idea. Would love to see about the first case and the first spreading and first reaction. Would be cool to see the characters BEFORE because we have the after.. just a matter of pulling it off, because like Rick said a couple comments below, it would be challenging to make the now older characters look younger again, or to find characters that look enough like the current characters, just younger. So over all, a prequel would be a great idea if they can pull it off.